← Queer+ Friends of Bradley Manning will be at this year’s Pride – please join us! 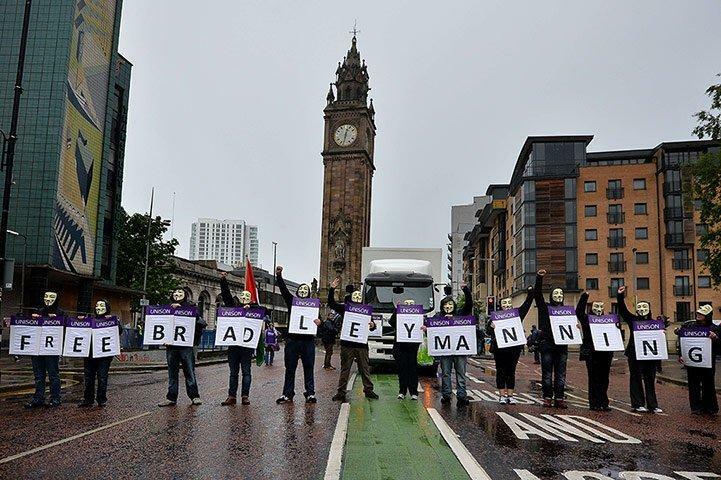 Like most Trade Unions, we were getting ready for the anti-G8 protest in Belfast; however, instead of our branch highlighting the evils of capitalism or the many local issues around cuts etc., I as chairperson of our branch proposed that we highlight the case of the incredible Bradley Manning. Once I told the branch committee about Bradley and his fantastic bravery we were set, and with great enthusiasm the branch committee was more than happy to highlight Bradley’s case at the protest in Belfast. 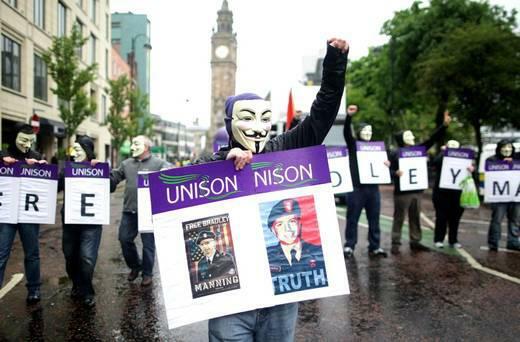 When the RVH (Royal Victoria Hospital) Unison branch activists arrived in Belfast on the morning of the protest we were met with hundreds of police officers who were informing the organizers (ICTU) that no one was allowed to wear masks. We chose to ignore this instruction and proceed with our protest. Once we all lined up dressed in black hoodies and V for vendetta masks we revealed our placards saying “free Bradley Manning.” It was met with a huge round of applause from the crowd and the press could not get enough photos. 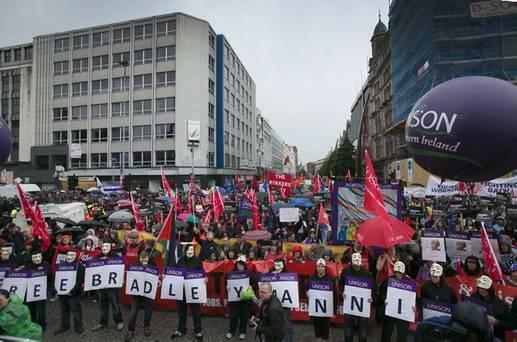 As we walked through the streets of Belfast the public clapped and cheered, not for us but for Bradley. I can not express the admiration I and the citizens of Belfast have for Bradley and for what he has done in the name of truth and justice. I place Bradley alongside the likes of Martin Luther King and other great people who have chosen to speak out when no one else would. History will absolve Bradley and in 20 years time his name will be on the lips of school children across the world and they will be taught about someone who is the very embodiment of bravery. I came into my 14 year old son’s bedroom the day after the protest and where once a poster of his favorite footballer graced the bedroom wall now hangs a free Bradley Manning poster, his choice not mine! Proof that Bradley’s bravery is infectious and inspirational to all. Obama talks about truth, bravery and justice but Bradley practises the real meanings of these words. He truly is one of the greatest American heroes and history will prove this a fact. 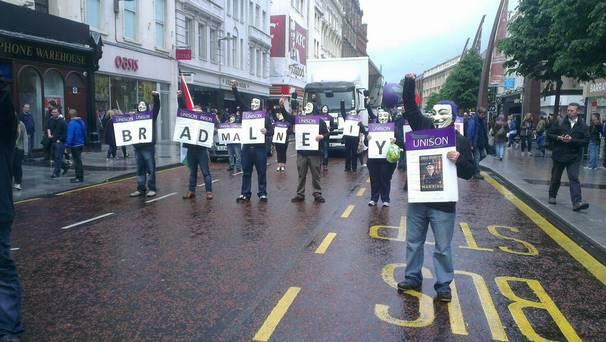 Gallery | This entry was posted in Manning, Reports, Uncategorized and tagged Belfast, Bradley Manning, demo, G8, Ireland, RVH, solidarity, UNISON. Bookmark the permalink. Thank you Belfast RVH Unison, Forward in solidarity !! !